Saturday January 30, 7:30pm: Music of the Stuart Age. With the Chelys Consort of Viols. 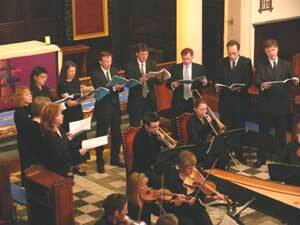 Music from the reigns of James I, Charles I and Charles II. At King Charles church. Saturday September 26, 7:00pm: Hear My Prayer, Favourites of the cathedral repertoire, at St Mary the Virgin, Buxted. Saturday April 25, 7:30pm: Favourites of the cathedral repertoire. Anthems and motets by Mendelssohn, Mozart, Bach, Handel and others, in aid of Music at King Charles. At King Charles church. Saturday October 12, 7:30pm: Rejoice in the Lamb at King Charles church. A celebration of the centenary of the birth of Benjamin Britten, with Michael Bacon (organ) and Ellen Smith (harp). Sunday November 4th, 6.30pm: Duruflé Requiem at King Charles church. A performance for All Souls. The choir visited Venice to perform a programme of music by English composers from Taverner to Vaughan Williams, alongside music by Venetians Bassano and Lotti. Music of penitence and redemption, including Arvo Part's 'De Profundis', 'The Beatitudes', and two slavonic psalm settings, as well as music by Josquin Des Prez and others. A concert of English 20th century music including Vaughan-Williams' famous "Serenade" for 16 solo voices, performed in an arrangement for piano quintet, with pianist Paul Guinery and string quartet led by Ken Aiso. A programme of choral and organ music from 19th and 20th century France. Saturday October 14th, 6pm: Choral Classics. Handel coronation anthems and well-loved anthems. With guest conductor, Hilary Davan Wetton. Sunday April 9th, 6.30pm: Duruflé Requiem at King Charles church. A performance for Palm Sunday. 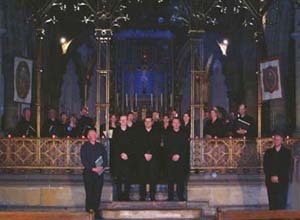 Photo: The King Charles Singers in concert with The Gregorian Singers, St Barnabas Church Tunbridge Wells, 10th May 2003. Listen to a live recording of O Nata Lux by Thomas Tallis. site design by Line of Site Want to join us? Singers wanting to join the choir, on an occasional or regular basis, are more than welcome to contact us. Good sight-reading is helpful, as we generally rehearse no more than twice for each event.